“If I had even one memory of her cooking on it, then…” My husband was unable to finish that sentence. How could he? My eyes were pooling, my bottom lip was trembling. My mother had only recently passed, and we were standing in her ghostly quiet kitchen, staring at her dilapidated O’Keefe and Merritt stove, making emotional decisions. 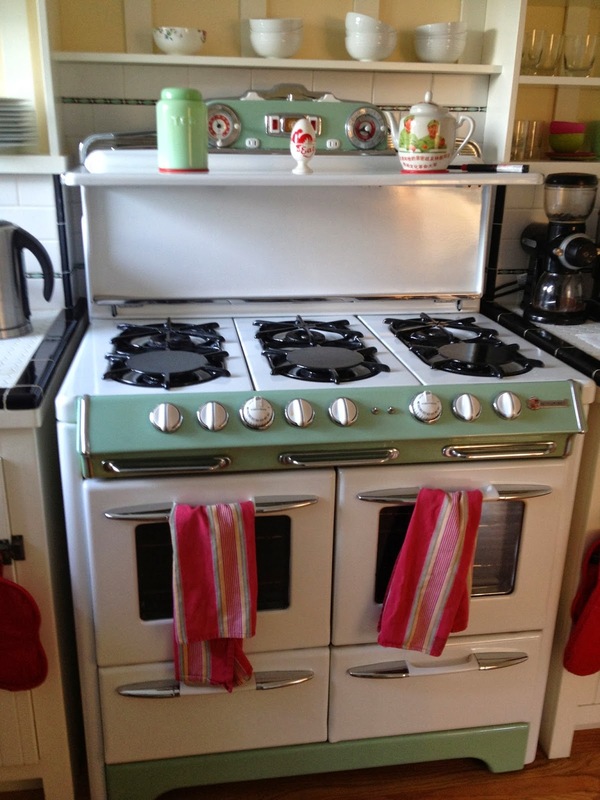 The stove would cost a lot more to put right than buying a brand new one, or even a similar re-conditioned one from ‘Antique Stove Heaven’—the place that had already offered up their astronomical ballpark estimate. But that was the least of it. 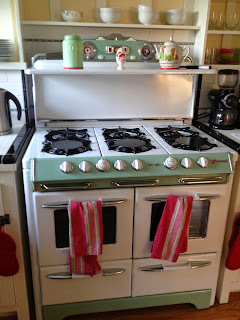 Adopting my mother’s stove would also mean remodeling our entire kitchen around it. Over the years I’ve dragged my family through more remodels of more fixer-uppers than most people have hot dinners cooked for them. If I’ve learned nothing from all of that it’s that no kitchen ever transforms itself cheaply. And my husband was right, my mom did not cook. Had not cooked, not for a very long time. I cast my mind back—I’d been with my husband coming up for 30 years (I was baby bride, don’t bother doing the math). Had she really not cooked anything for over 30 years? Did she ever cook? I have a vague recollection of her stirring something on the stove top… once… but it’s such an early childhood memory, so lost in the mists of time, I could be just making that up. “But we…we ate,” I said aloud. My husband looked confused. “Chicken Delite. Or pizza,” I admitted. His confusion seemed to deepen, but I’d answered my own question, remembering my youthful excitement over the parade of young delivery boys who showed up on our doorstep bearing food. “That’s where I get it from!” I said, connecting the dots, unbelievably, for the first time. “I don’t cook either! She passed that on to me!” I exclaimed, like that was a good thing. Well, I don’t. Cause I’m crap at it. Burning is my specialty. I’ve had to remove all smoke alarms from our house, that’s how bad it is. It was like those alarms just knew. I only had to step near the stove and off they’d go. When our kids were little I remember offering to cook for them once, and their little faces broke into panicked anguish: “NO MOMMY, NO! PLEASE, NO!” they cried, like I was Joan Crawford threatening them with a wire-hanger. It was awful. I never offered again. The only thing that saved us from complete starvation is my husband’s genius cooking skills. Whether that particular gift was in his original gene make-up, or an artistry born out of necessity, we’ll never know. Point is, he’s smokin’…in a good way. “But… but… you will,” I said, bursting into fresh tears. Tears of the grieving trumps all reason. And so, with that, our fate was sealed. Another remodel. It brought to mind the last remodel we’d endured in a different house—the one that had me swearing it was the last one. Fixing up homes has been a sideline/addiction of mine, and until someone offers up a 12 step program, I may never be fully recovered. But that one had been particularly painful. Way over budget, way over-long, a certain psychosis had set in: I’d actually resigned myself to the idea that Chuck and his cohorts were a permanent fixture in our house, part of the family. They’re nice guys, I remember thinking, is it really so bad living with them…forever? Is it really so bad living with an unending root canal? Yes, is the answer. It was really so bad. And in the midst of it, my father passed away. “Chuck,” I said, my eyes pooling that time too, chin trembling, full grief-mode, “you have to go. (You, and your saws and your hammers and equipment, and your workers, and your dust and your chaos, and your invoices, and your intrusion, and your never-ending and-and-and…). End of the month, Chuck. We’re having a memorial here in our home… for my father… and…” I couldn’t finish the sentence. I didn’t have to. Chuck was gone. You could say it was manipulative, opportunistic. But I knew it’s what Dad would’ve wanted for me. He was a builder himself, and he had a sense of humor. And I also knew Mom would’ve wanted me to have that stove, if only for the symbolism. She was a woman who refused to be a product of her time, she was unchained to her stove. It would be a classic reminder. I really love Day of the Dead. It’s such is a beautiful concept; a day when we commune with those on the other side. A time to remember, to appreciate and express our gratitude for all they gave. But I especially like to ponder the many and varied ways they continue to give and enrich our lives, even after their ‘quote-unquote’ passing.